Come spend Halloween weekend at OlioHouse. 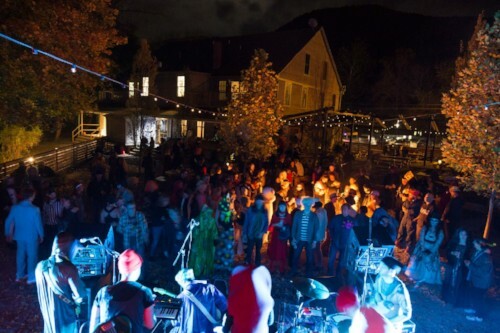 Not only will we have amazing Olios taught by Lauren Hudson, and time to explore the fall foliage, we'll also have access to one of the best Halloween parties in upstate NY. Just a 5-minute walk from our space, the Wassaic Project, a 7-story renovated mill grain will be converted by a team of 10 artists into a haunted house. Venture up the creaky stairs for seven flights of frights then dance the night away with djs and live music. We'll even have a midnight showing of The Witch for those brave enough to watch it in a barn. We would not have the capitalism we have today without the fear and subsequent suppression of the women who maintained the commons. Their stewardship threatened this new form of accumulation, and so they were regarded as subversive, dangerous, and threats to western Christian progress. This is how the ‘witch’ was born and hunted. This weekend retreat will focus on what the commons was (and is), how it was threatened, and how the project of commons enclosure and transition to capitalism could not have been accomplished without deliberate, gender-based violence that eradicated hundreds of thousands of people. 2:30pm - Free time to explore Wassaic and hangout around OlioHouse. 4:00pm - Lauren will teach "Disenchantment & Dominance: Witches, Capitalism, & the Commons"
9:00pm - (Optional) Things will migrate over to The (Jack-O) Lantern for the Monster's Ball. Enjoy live musicians and DJs and calm your nerves with all manner of cocktails and spirits. If you have a costume, that is. Late Night - Screening of "The Witch" in the Olio Barn. Aside from the physical enclosure of common lands, the transition to capitalism in the 15th century meant great social upheaval, especially in the relationship between labor and gender. Often this shift is left out of the official history of capitalism, when in fact it was central to how the system unfolded. We would not have the capitalism we have today without the fear and subsequent suppression of the women who maintained the commons. Their stewardship threatened this new form of accumulation, and so they were regarded as subversive, dangerous, and threats to western Christian progress. This is how the ‘witch’ was born and hunted. This weekend retreat will focus on what the commons was (and is), how it was threatened, and how the project of commons enclosure and transition to capitalism could not have been accomplished without deliberate, gender-based violence that eradicated hundreds of thousands of people. We will discuss how ‘gender’ was a category made through shifting labor relationships, why those divisions still affect the way we see labor struggles today, and how, in the 19th century, several communal groups settled in the ‘burned over districts’ of upstate New York and Massachusetts to revive the project of ‘the commons’. We'll explore how the ‘witch’ was born and hunted and how great social upheaval around labor and gender helped capitalism unfold.